Tinydeal - is a web-site that offers you a great variety of goods, from different small stuff to tablets and cell-phones. It offers you more than 50 000 kinds of goods. The delivery across the world is traditionally free (but only up to 2 kilograms). Neither it differs much from FocalPrice, nor from DealExtreme, though it should be noticed that you can pay with Visa and Master Card credit card. However it is recommended to use PayPal – it is more reliable and, in addition, there is restriction – 150 $ on a card, though it used to be 250$. A track-number is given in case of an order over 33$. And there is an interesting moment: if your order includes several items, the majority of those items have to cost more than 33$ - only in this case it is possible to receive a free track-number. Or you can pay from 2 to 3 $ for it. The delivery takes the usual terms from 2 to 3 weeks; however it can sometimes take less. Occasionally there is a lack of some item in the order, in that case it is possible to send a note in the support-service and receive the lacking item. The Tiny Deal prices are quite reasonable, but still, the shop has a system of bonuses, it is possible to find 5-7% discount coupons on the internet and you also have a chance to earn some extra points (by writing reviews, comments etc.) that can be paid for some goods you want to buy. You can read about this information more detailed on their web-page. If your order exceeds 200$ you are welcome to use a pleasant bonus - Tiny Deal offers you several gifts: a remote controlled UFO, a cube made of magnetic balls, or something else. 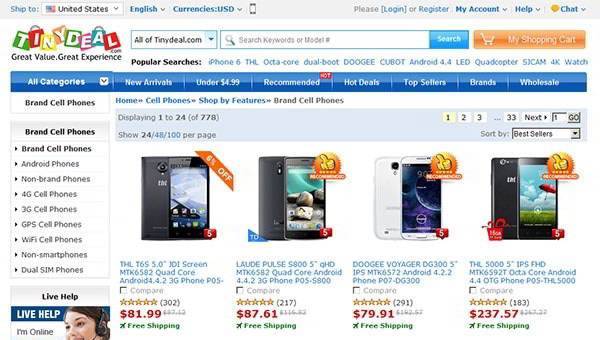 The quality control system is not as good as at FocalPrice or DealExtreme - that explains the lower prices. You can confidently buy inexpensive things here. And if you decide to buy a cell-phone, for example, it is recommended to do it over PayPall. In that case you have more chances to receive an item of a good quality without any flaws. All the Chinese shops have a serious attitude to PayPal because you can appeal against a controversial situation and get back the money or change the item for a flawless one. Hi sir can we get the product to india which shopped. hello,Is it true that I cannot use my usa credit card to buy a phone worth over $500 from your website? Hi All, I really like the website cause Ive already recived so many items I ordered and I will be buying from it. Thank you so much fot this amazing site. Very disappointing. I buy often from China shops. Typically for a new shop I start with a small item. Here I ordered a small $1 item (ir led for phone). This did not arrive in five weeks. First response: wait longer, holiday, bad weather and held up on customs. Filed paypal dispute: new response: please wait longer. I complain, answer: please provide info from post office that the package did not arrive. Yeah right. They did send untracked and did not provide a tracking number. They are just playing with my feet. And frankly I do not care about loosing a dollar. However their response of asking for post office confirmation is really completely off and disrespectful to the customer. I was planning to order some more stuff there, but will bring my business to another shop that is more customer-friendly!